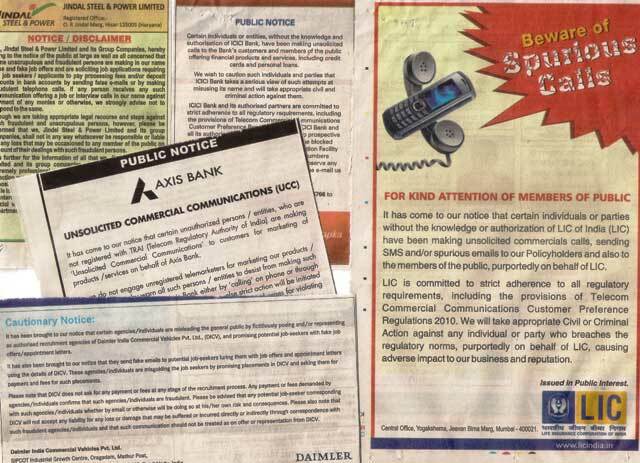 Axis Bank, DAIMLER, Jindal Steel & Power, ICICI and Life Insurance Corporation of India have issued notices in newspapers against unsolicited commercial communications, cautioning the general public and seeking their urgent attention. “It has come to our notice that certain individuals or parties without the knowledge or authorization of LIC of India have been making unsolicited commercial calls, sending SMS and/or spurious emails to our Policyholders and also to the members of the public, purportedly on behalf of LIC,” says an ad issued in public interest. While Jindal Steel & Power say in a disclaimer that fraudulent persons are making in their name false and fake job offers and are soliciting job applications requiring the job seekers to pay processing fees, Axis Bank informs that it does not engage unregistered telemarketers for marketing products or services. Fraud persons are misleading the general public by fictitiously posing as recruitment agencies and sending fake emails to potential job-seekers luring them with job offers and appointment letters, cautions DAIMLER India in its notice. Police are already investigating a job racket in fake Maruti mails. Criminals come in variety of forms and they have taken their latest avatar in cyber world with expertise in identity theft, fraud, and viruses. India’s Hindi Cinema has also introduced the subject pretty well in ‘Mickey Virus’ film which is an unpredictable comic thriller based in the lanes of capital city Delhi where the police hire a hacker to crack the hackers in the crime world. Setting strong passwords, changing them regularly, and not sharing them with others. Keeping operating system, browser, and other critical software optimized by installing updates. Using privacy settings and limiting the amount of personal information posted online. Talking with your friends, family, colleagues and community about Internet safety including any suspicious activity in your computer or electronic system. Being cautious about offers that sound too good to be true. Cybercriminals do not discriminate. They target vulnerable computer systems and people and hence priority should be to minimise chances of an incident. Authorities should regularly hold awareness and safety campaigns aimed at curbing rampant increase in cyber crimes, especially among minors. Children in particular should refrain from entering adult and hate sites, while students should be made aware of the cyber laws of the country, and elders be made part of advertising publicity campaigns creating awareness in communities. WHEN YOU ARE ONLINE – Stay alert, cautious, smart and secure and away from a wild world. Don’t blindly click links that you see online — on email, searches or networking sites. You must also raise eyebrows when you get directed to an altogether unexpected site that you did not intend to visit. Previous Who will be BCCI Team India’s new sponsor! Hello! I know this is somewhat off-topic however I had to ask. Does building a well-established website like yours require a large amount of work? I am completely new to running a blog however I do write in my diary every day. I’d like to start a blog so I can share my experience and thoughts online. Please let me know if you have any suggestions or tips for new aspiring blog owners. Thank you!